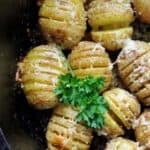 Hasselback potatoes with cheese is a simple, delicious recipe. These baked potato slices are crispy on the outside and tender on the inside, making them a perfect side dish! through the potato.) Slice horizontally into 1-centimeter sections. Soak potatoes in cold water for 10 minutes (this helps the potato sections open up). Place potatoes in oven safe skillet. Brush butter mixture onto potatoes. Add parmesan cheese to potatoes.